In the early issues of Martha Stewart Living there was a great column called "Find of the Month." It was usually a DIY project that involved converting an everyday item into a useful tool or decorative item: turning an overturned flower pot into a twine dispenser, or a garden-storage bench into a bedroom trunk for blankets and sheets. 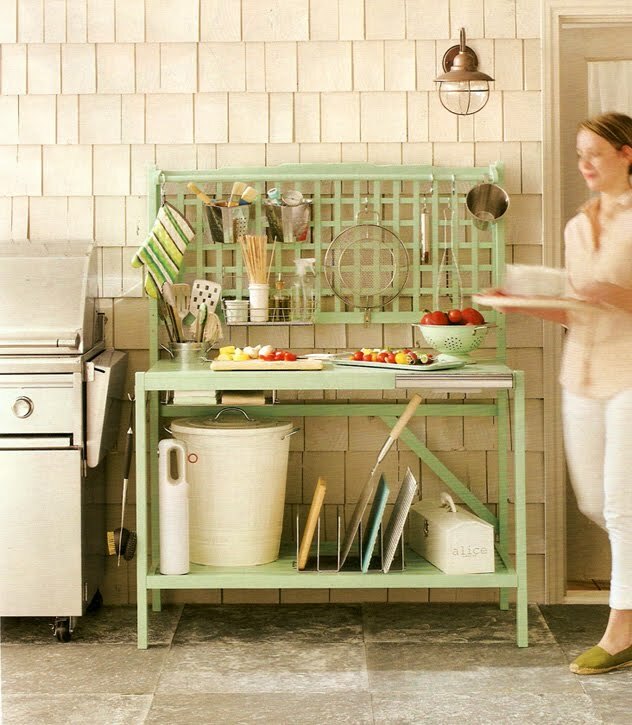 In the June, 2011, issue there was a similar homekeeping column that really impressed me: turning a folding, wooden potting bench into a grilling station. We all know that most portable grills provide only a tiny space to keep the necessary tools in place. The editors expanded the outdoor work surface needed for regular grilling by outfitting a wooden potting bench ($122 from csnstores.com) with add-ons that include stainless steel bins to hold basting brushes, wooden skewers and thermometers, file dividers and mail trays to hold cutting boards and dishtowels, s-hooks to hold oven mitts and larger grilling tools. The bench was painted a lovely green (Martha Stewart Living exterior latex paint in Feldspar) and provides ample surface to keep the food you are preparing to grill. The brilliant thing about it is that once the grilling season is over, you can use it as a potting bench for fall bulbs and transplanting, or simply fold it down flat against the wall until next summer. I love ingenuity and the unimagined! Kenn! I totally agree! This is a great project. I am thinking that this summer it is really time to put in a grill stations. I can't wait to see how it turns out! Thanks for the great post. For sure, my husband and I are definitely going for grill stations this summer. I'm excited to get the ball rolling with this project! Yes!